Are Some Republicans Ready to Abandon Ted Cruz for Beto O’Rourke? Polling firm finds some Republicans are ready to cross party lines. Beto O’Rourke Is the National Democrat of Texas, But Will That Help Him Win? A new survey found Republican U.S. Senator Ted Cruz continues to lead Democrat Beto O’Rourke in this year’s election among likely voters, but there are troubling signs for Cruz. The poll by Crosswind Media and Public Relations found 15 percent of the self-identified Republicans surveyed are willing to vote for O’Rourke, and so, too, are an equal percentage of respondents who described themselves as conservative. Overall, Cruz is leading O’Rourke 47 percent to 44 percent among likely voters, with a margin of error of plus or minus four percentage points—making the race a statistical tie. Crosswinds is a national public relations firm based in Austin and leans Republican. Some of the past Crosswind Texas Pulse polls can be found here. This is the first poll I’ve seen where O’Rourke had high name recognition. In past surveys, somewhere between 25 and 38 percent of the voters polled did not know enough to have an opinion of him. That was down to 7 percent in this survey. But while 50 percent of the registered voters have a positive view of O’Rourke, his negatives are now up to 38 percent. As we noted in an earlier post—Some People Think Ted Cruz Is a Jerk. Is It Enough to Make Him Lose?—Cruz is having difficulty with the likability factor. In the Crosswind survey, 51 percent of those surveyed viewed him positively, while 45 percent held an unfavorable view of him. Among likely voters who did not state a party affiliation, 52 percent said they had a negative view of Cruz. In the governor’s race, incumbent Republican Greg Abbott is leading former Democratic Dallas County Sheriff Lupe Valdez 52 percent to 39 percent. Abbott even has 38 percent support among Hispanic respondents. He is certainly not likable. Hopefully he will be defeated because he has been a horrible senator for Texas but it will be ok with me if it is simply because he is not likable. You stupid idiot- the only thing you can say is he us unlikeable? What a clown you are. he is certainly qualified, honest and competent – unlike corrupt Robert O’ Rourke. Sounds like you have your candidates mixed up. What illegal substance are you smoking? I have never taken a drug in my life- legal or illegal. And what about you? You’re calling names. Typical republickin reply. You should look in your own backyard before you act like a child. Speaking of children, what is your president doing? What has he done to hurt America today. I can’t wait till he is gone. What a joke. They aren’t real Republicans, and certainly not Conservatives if they are willing to vote for O’Rourke. Nobody with a job and love for their State would vote for Beto. He likely appeals to people who identify first as Americans. Your picture is of a monkey. What’s that about? Why would Texans vote for a fake Hispanic with a criminal background? That would be like using that fake picante from New Jersey! Get a rope! Good lord. Rafeal Cruz is a Canadian from Cuba. He is a natural born citizen. Stop with the fake crap. Ted Cruz was born in Calgary, Canada and immigrated with his parents. His mom was a US citizen. Nothing fake about it. Only a natural born citizen can be President and Cruz qualifies. You’re considered a natural born citizen when one of your parents is a US citizen. Ted was born in Canada. Beto was born and raised in Texas. Your first sentence is correct … what I just said. The rest is meaningless. O’Rourke is a Texan by birth, but not by the way he conducts himself. Vote for him. He’s down by 9 points right now. In one poll. One. Check the others. Because Cruz is not doing what he was elected for, that’s why! You know, things that matter to Texans and not to his vile, insane, idiot, bottom feeder president. Maybe you don’t know or care but trump will destroy America as we knew it. Beto is a man that cares about what he can do for Texas and America. Cruz, on the other hand wants what Texas can do for him. We will be give him the gift that keeps on giving, by voting him out of office and replace him with Beto O’Rourke, a man that will vote for us!! If Trump has plans to destroy America, he needs to hurry up and get with the program because he’s already 2 years into his first term and things keep getting better…. You need to improve your reading skills. Tell me where did I say he has plans to destroy America? You can quote what I said to confuse you. You are free to copy and paste if you need to . If you promise to use it on yourself. I will gladly buy a rope and bring it to you. Cruz has done nothing for Texas, so I will vote for Beto. Or you could just move to California and get some Beto politics…. CA is doing just fine. Or, we could just vote the way we are inclined and stay where we live.That IS the American way. that just reaffirms how out of touch you are. Beto= pandering, weak, criminal metro sexual, liberal pantywaist who will say every touchy feel good talking point but has accomplished nothing except a DUI, breaking and entering and enriching himself through eminent domain while on the city council in El Paso. Except for the part about El Paso, what you write sounds like a very apt description of our current POTUS. Why would you vote for an Irish American posing as a hispanic to get votes? Our environment is paramount. It is one of the most crucial items on the political agenda and unfortunately, the Republican party has abandoned most attempts to protect this vital asset. With their abandonment comes mine. Ted Cruz wouldn’t stand up to defend his own wife and father. Why would anyone think that he would stand up for his adopted state and country? Ted Cruz is the bigger man because he puts the best interests of Texas and this country ahead of his pride. I know that may be impossible for some to conceive such as yourself being that you are guided by your emotions rather than logical and rational thought. Ted Cruz is a natural born citizen. Only the most foolish would think otherwise. Hey José! I have a great idea! Let’s debate the issues about this election! Are you brave enough to accept this challenge and risk being made a fool? Cruz is a natural born citizen. He could not have run for President otherwise. Your moniker is certainly apt. You live in la-la fantasy-land. Twist off, you impotent piece of snot. I can’t see FM’s reply to you, because I blocked him for puerility. Wonder what’s on his mind? This moderate Republican is utterly disappointed with Ted Cruz. The GOP in Texas has grown corrupt and complacent. I’m voting for Beto. Ted Cruz has done more for you than anyone in your entire life and you’re “utterly disappointed with” him? That displays just how foolish you truly are. this is something pearl would……pearl? You know the crazy lady that posts here…. Beto wants a job on CNN, where he would fit right in. Fine… no problem here, but if you think that Texans – who know and understand the driving forces behind the strength of the Texas economy – will put an unashamed Socialist in charge of it? Tell me where the betting window is, because I can make some money on those kind of odds. speaking as an unashamed socialist … beto isn’t one. but is the question WHETHER he will win, or whether he would be a BETTER choice? i know it’s important for many to be on the winning side (that’s where the money is, as you seem so keenly aware), but i’d rather be on the right side. i’m not putting money on a democrat to win in texas, but that says nothing about who would actually better represent the interests of texans. (the “strength of the texas economy” for WHOM? we have higher rates of poverty, high school dropouts, teen pregnancy, children without health insurance, and on and on … than almost any other state. but at least you’re making bank, amirite chad?). embellishment aside, o’rourke pled guilty for his crime and served the punishment. are you sure that’s the kavanaugh analogy you want to make? No he didn’t. He got off. Tried to run, but was caught and not charged. And I did not make an analogy. 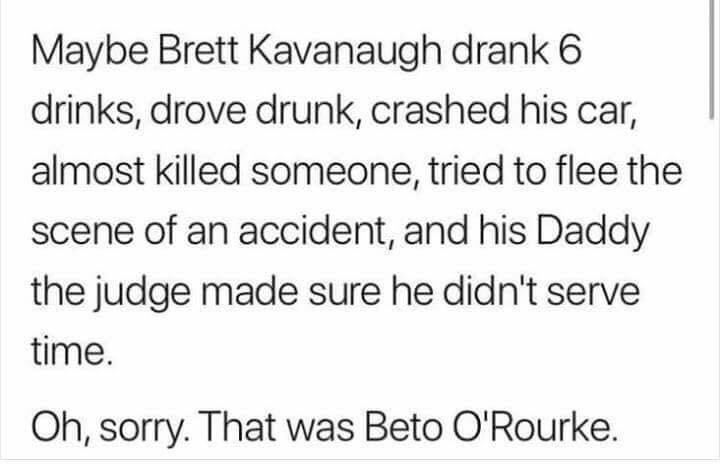 I made a fun dig at O’Rourke. This is a standard outcome for a first time DWI. You have to plead guilty to enter such a program. The claim of special treatment is entirely fabricated. Wrong. He tried to run, but was stopped and, as I said, was not charged with leaving the scene. It was fixed. Can you substantiate that claim? I provided a citation. You’ve just provided a screen shot of somebody’s phone and some speculation. Your polls are so full of crap that I can smell them from here! You can vote for Beto, then we will have Socialism – then you can eat your zoo animals like they have had to do in Venezuela. How many “useful idiots” will it take to prove that Socialism does not work? I look at the comments of most of the GOP supporters in here and it speaks volumes about what your organization has become. Quite frankly you all seem like very rude and hateful people. You have done little to win over this Independent voter to your cause, matter of fact you have pushed me away. Beto looks like a weak lil girl. Only a limp wrist man would vote for this pathetic excuse for a male.